Off-roading is just plain fun. Driving on narrow trails in beautiful areas of the country that not many people go yields an air of excitement, wonderment, and an appreciation for life and this great country we live in. Off-roading is not new. In fact, it’s been around for over 100 years (and longer if you think of horses instead of vehicles in the same sense). The urge to explore and see and do new things has been ingrained in humans since the dawn of time — technology has just made it easier. 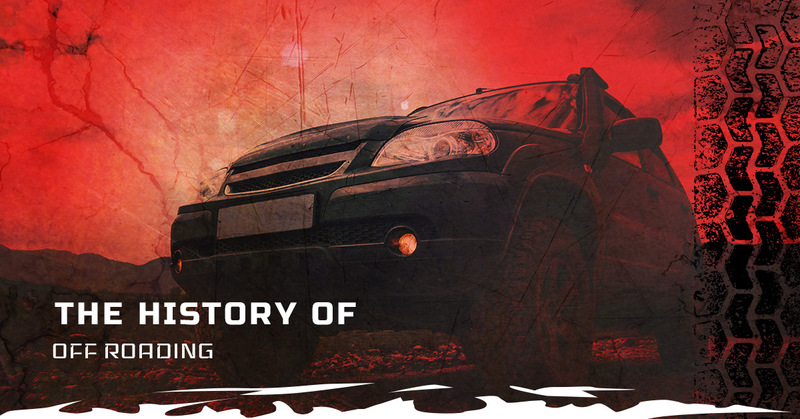 Off-Road Rim Financing, the best source for tires financing, will explore the rich history of off-roading in this blog post. Picture a man with tractor style tracks placing this on a vehicle and driving around in it. Yep, this was the first off-road vehicle invented in the early 1900s by a man named Adolphe Kegresse. As much as we’d like to think this invention was for fun, it wasn’t. It was an attempt to take the military version of the tank (it is, after all, the military that pioneers a lot of technological advances for usually un-altruistic reasons) and make it for civilian uses. Kegresse’s invention (known as the half-track) used the regular front wheels and tires and only changed the back tires with his modification. This allowed for the off-road capability of military tanks to be handled like a car. The Tsar of Russia was the first to use these in his motorcade in 1911. Known as the Kegresse Track, Kegresse’s invention did not use the metal interlocking belting system tanks employed. Kegresse’s flexible tracks spread the vehicle’s weight over a wider area, which made it easier to navigate the tough terrain found in Russia, Asia, and Africa. It didn’t take people long to realize the advantage of Kegresse’s system, modify it, and improve it. Tracks disappeared. Vehicles such as the Jeep of World War II became popular since they were easy to get in and out of during military excursions, was relatively compact, and had great tires. When the war ended. Jeeps that went off road were everywhere, not doing much. So what did Americans do? They realized how versatile the Jeep was and started driving them around the amazing landscapes of North America. The public caught on and soon off-roading became a popular US past time. With demand, came innovation and the better and more comfortable became the off-road vehicle. Americans realized there were many more uses for the off road vehicle than just driving around, including being used in hunting, exploration, racing, and as work horses in a number of industries working in rural areas. Off-roading today is a dearly beloved pasttime, both in winter and summer. As companies such as Off-Road Rim Financing offer financing for off-road wheels and off-road tires, off-road vehicles are easier to obtain and to customize. Having the right tires is important for off-roading. At Off-Road Rim Financing, we offer All Terrain, Mud Terrain, Rugged Terrain, or Highway tires in all of your favorite, top-of-the line brands, and superior quality. Not sure which off-road tires are for you? Give us a call, and we can help. If you are in need of wheels financing, our application process is simple. Simply decide which off-road tires you would like, fill out our credit application online, and a friendly sales associate will be in contact with you shortly. Unsure what your payment will be? Check out our payment estimator online. Off-Road Rim Financing is passionate about off-road tires and tires financing. We believe in enjoying life now. Call us today! At Off-Road Rim Financing, we are just as passionate about off-road rims as we are about off road tires. With off-road rims, you are able to personalize and customize your truck or vehicle that says something about you. We offer every wheel line available for lifted, leveled, or stock vehicles. Remember when selecting off-road tires and off-road rims to keep in mind the primary use of these tires and rims. For example, if you plan to go off-roading regularly, especially over rough, rocky, or extreme terrain, you’ll want a heavy duty wheel with tires at least 35 inches in diameter. Try to select the off-road tire that will suit your terrain as well in terms of tread pattern. Off Road Rim Financing recommends at least an off-road tire that is 37 inches in diameter and an aggressive tread pattern for either muddy or dry terrain. In wheels or rims, you’ll want to choose the material it is constructed from and your vehicle type. The main decision is if you want steel or alloy off-road wheels. This decision comes down to performance versus looks for most people. Steel wheels are designed to handle intense off-roading, with a tough, durable rim that can withstand constant impacts from heavy loads. Alloy wheels are constructed out of lightweight aluminum composite materials, which are easier to customize and design. For speed or towing, alloy off-road wheels are your go-to. With the ability to be finished and polished, alloy off-road rims have the shine that just looks good on trucks and other vehicles. Off-Road Financing offers wheels financing for all of your off-road rim needs. We offer free quotes online and 90 day, no interest payment plan for up to 36 months on all the products we offer. From lift kits for trucks to bumpers and nerf bars, Off-Road Rim Financing is your off-road shop. Contact us today to get started!